The Rivets Elecap-Zr electrode caps are manufactured from a copper-chromium-zirconium alloy (RWA Class 1, UNS C15000, ISO 5182 A2 / 4). They are ideal for spot welding by resistance of galvanized steel and high strength plates (DUAL FACE, TRIP, PHS). Produced by cold forming process the Elecap-Zr have a high hardness comparable to conventional caps produced with copper-chromium alloy or copper-chromium-zirconium. Due to its high electrical conductivity the Elecap-Zr perform their work with much less energy. 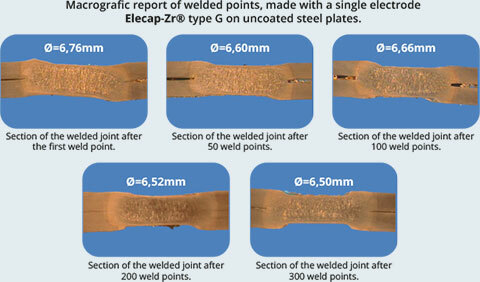 Due to low zinc contamination, when welding steel with this coating, the Elecap-Zr welding with quality the greater number of points than conventional caps. 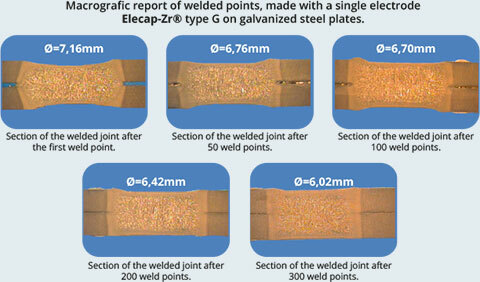 The Elecap-Zr provide fewer stops in production lines for cleaning or replacement, resulting in increased productivity when compared to conventional caps. The Elecap-Zr have the mark "R" coined in the inner cone background. The Elecap-Zr are produced in Brazil. Typical application: Spot Welding by resistance of galvanized steel and high-strength steel sheets (DUAL FACE, TRIP, PHS). Our team is focused on implementing effective solutions aimed at cost optimization.